This post is adapted from my other site (HERE). I wanted to include it here, because when Boy was little, he loved this meal. It’s cold, y’all. How cold is it? (relative, Northerners, relative!) 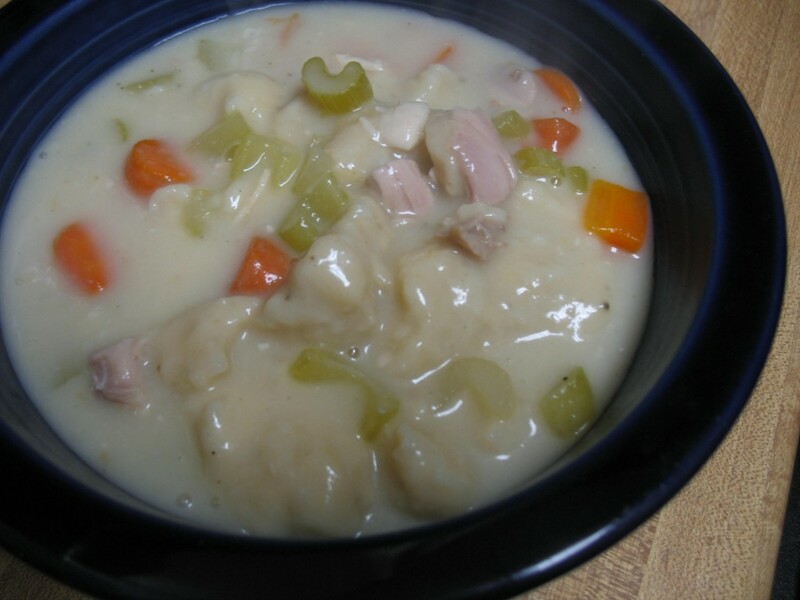 Cold enough to make Chicken and Dumplings! Let the pictorial begin (I feel it necessary to express how much I hate the fluorescent lighting in my kitchen. 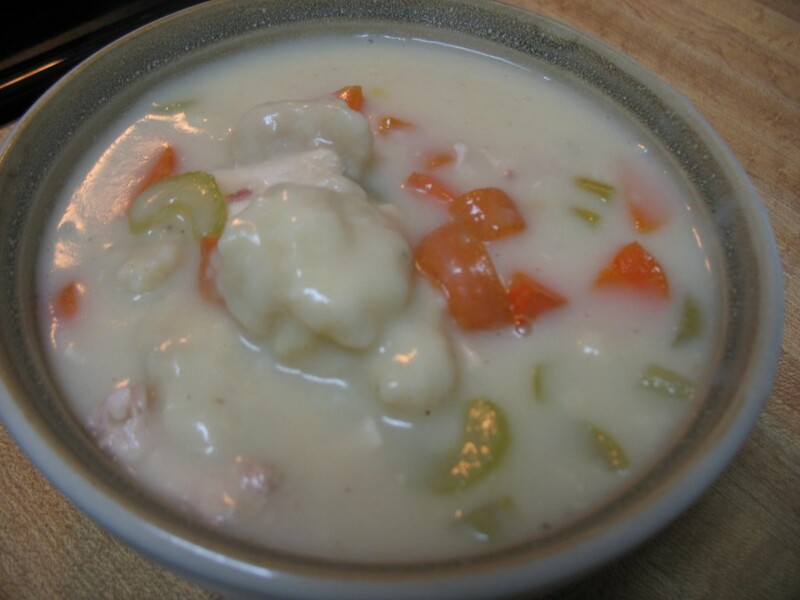 While it lights the way for cooking, it’s horrible for pics): This is the easy version of Chicken and Dumplings, I’ve Sandra Lee’d this because I was short on time. 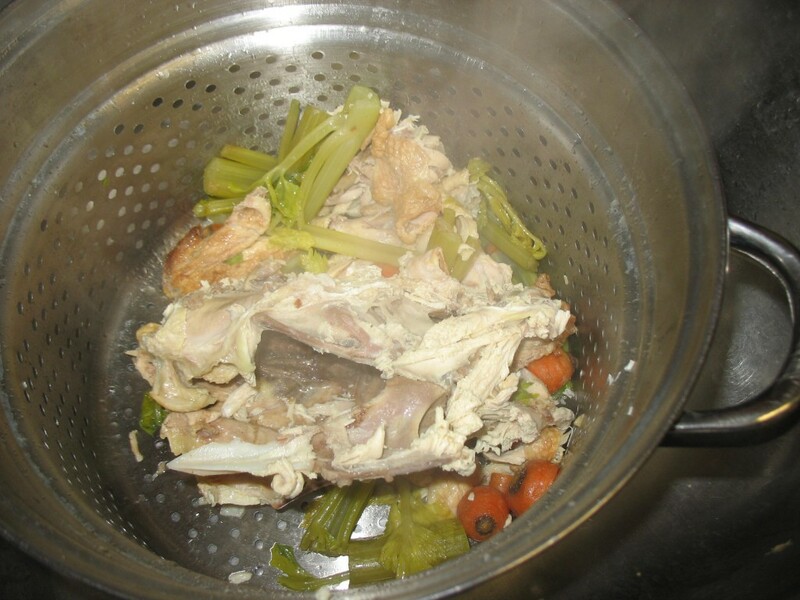 One rotisserie chicken, with all the meat stripped, leaving the carcass for making chicken stock. 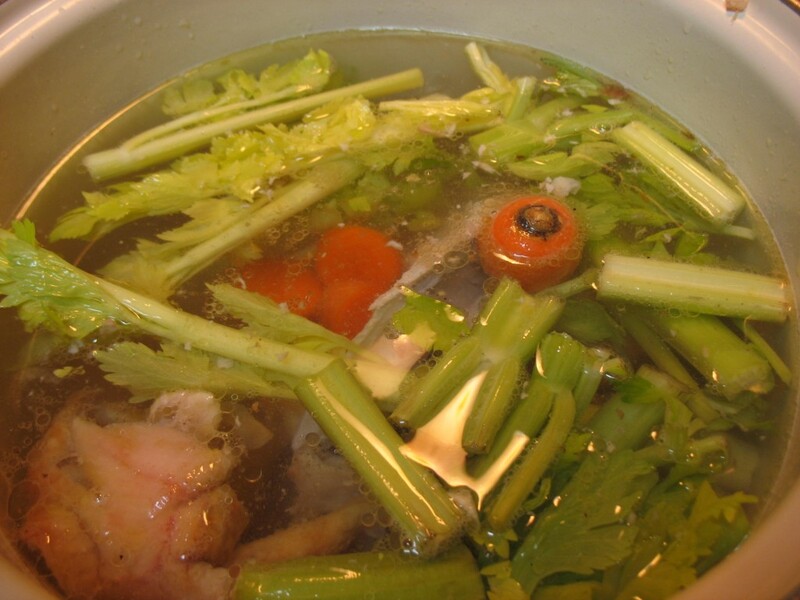 You can use canned stock, but this way is tastier. 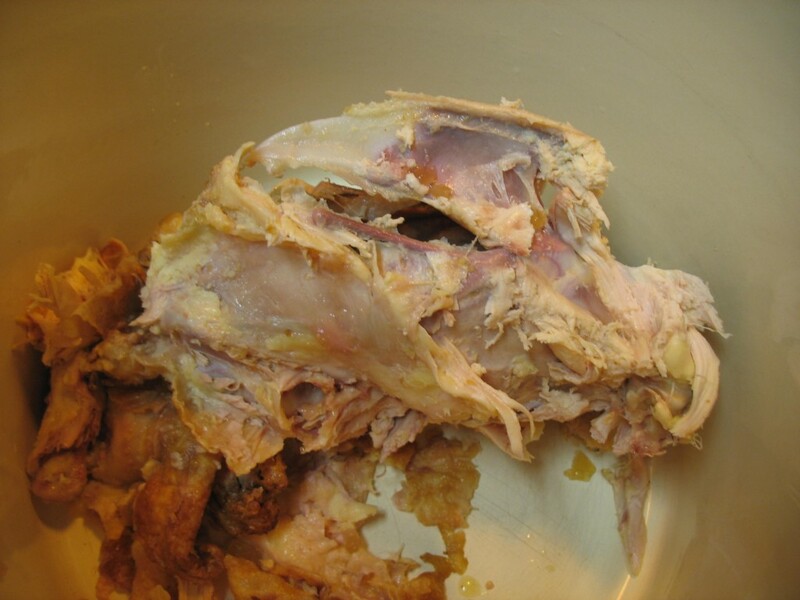 Set aside meat, with some still needing to be deboned. 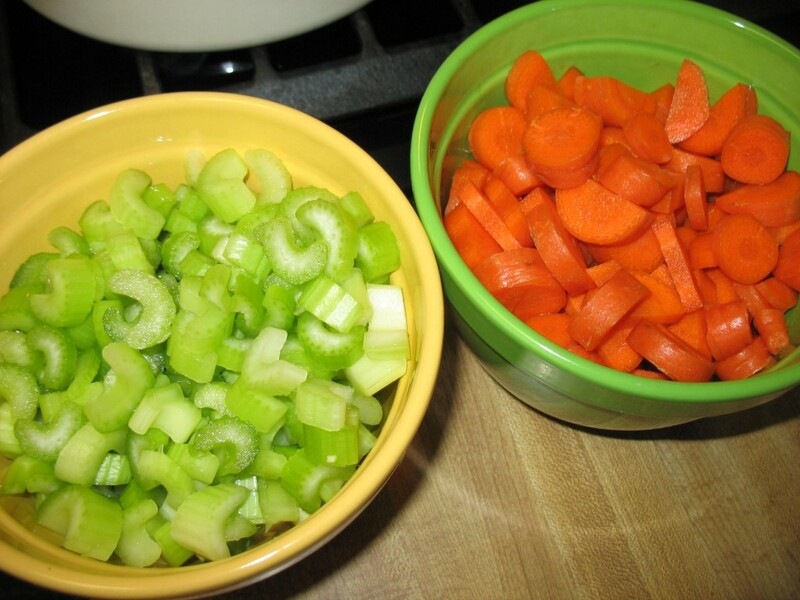 While waiting on water to boil, chop your veggies. I used both packages in their entirety. Flash used on my bowls. Overexposed! 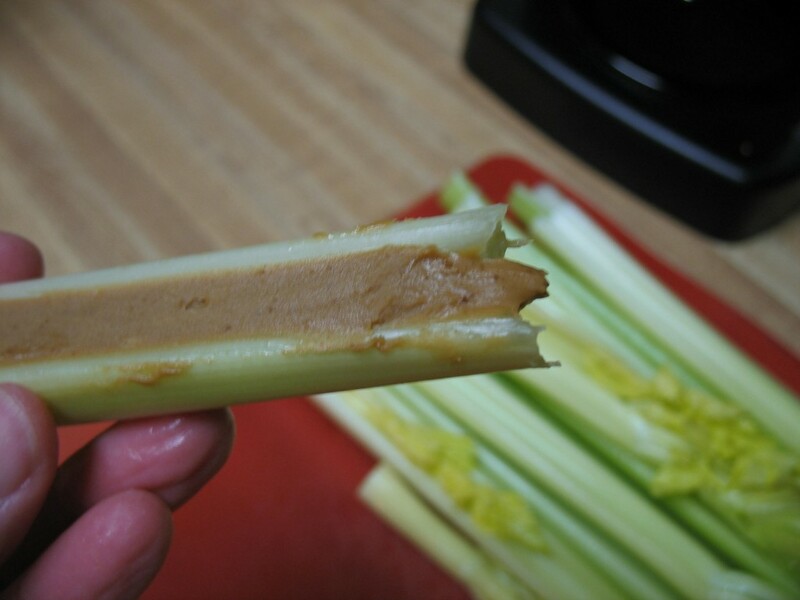 IMPORTANT NOTE: Reserve one stalk, schmear generously with Cookie Butter, eat, mumble to yourself about Heaven, then proceed with rest of meal. 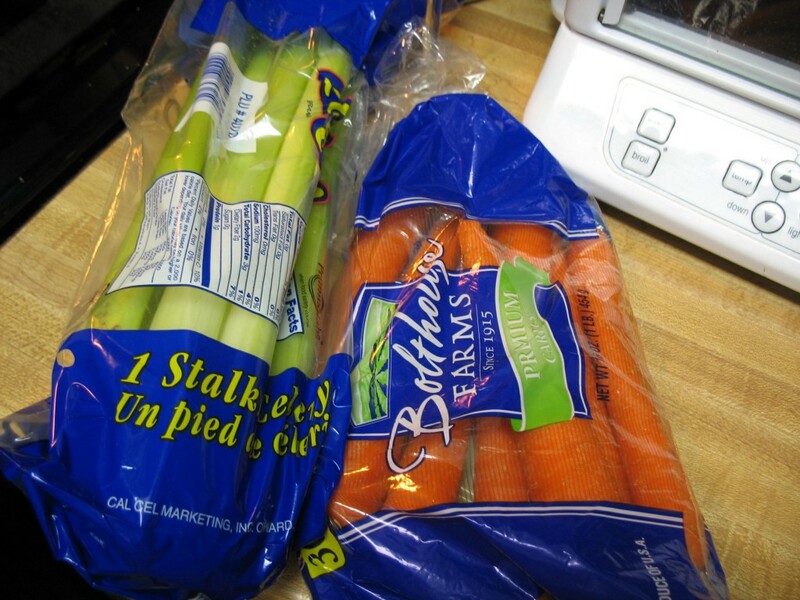 Place the butts of the celery and carrots meant for the trash into your pot. No worries. They will be strained out and not eaten, but they add flavor. 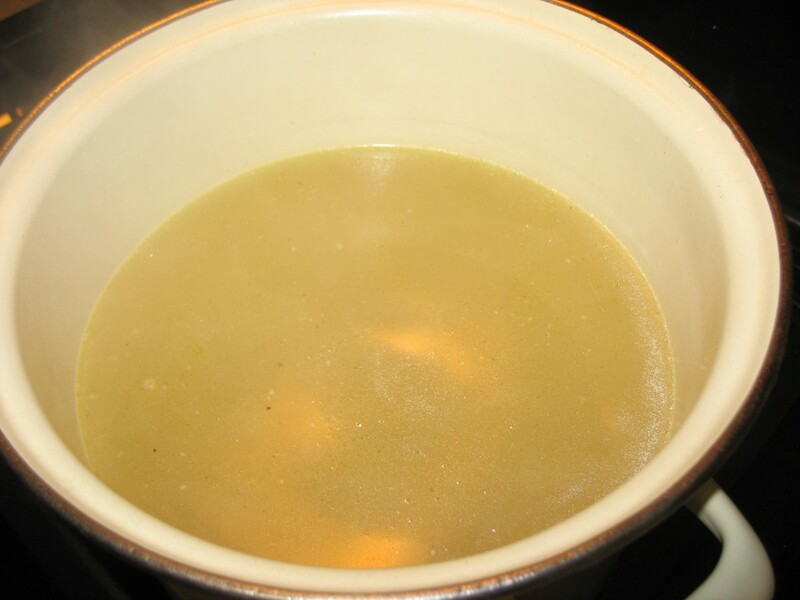 Once water comes to boil, reduce heat and simmer for 20ish minutes. More if you’re on Facebook leaving a HIGHlarious status update and you forget the stock is waiting on you. Strain the stock. I may or may not double strain stock. 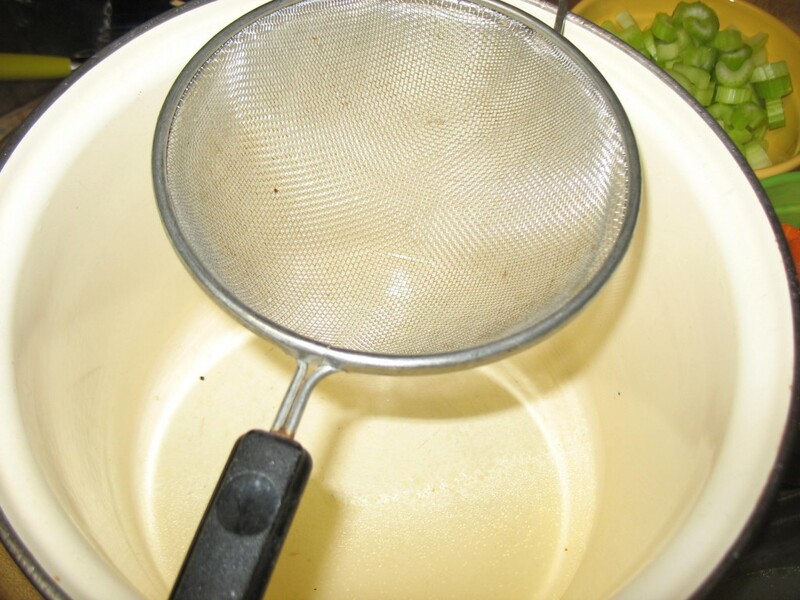 The second strain was with a smaller meshed strainer to catch the finer bits. This goodness is what’s left as your base. Because I don’t like to cook just for two, but an invisible army instead, I used all the stock. 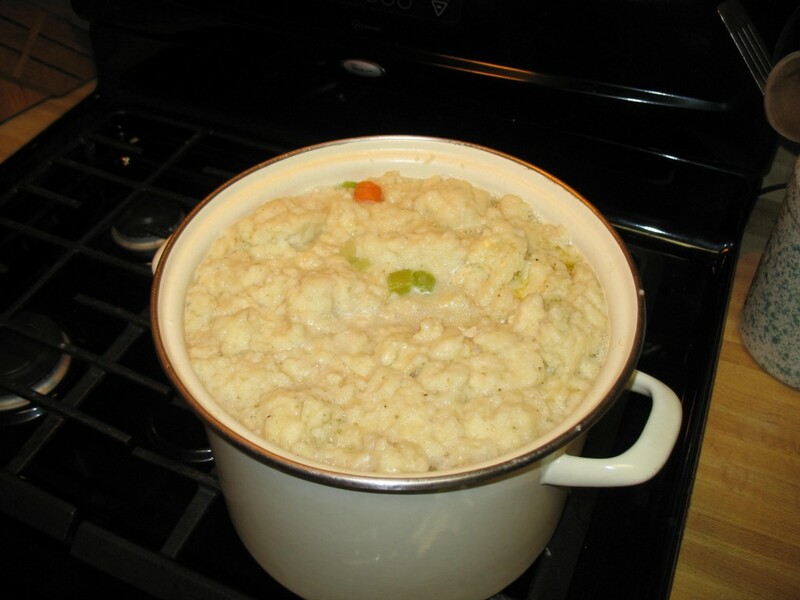 You can certainly measure out what you’ll use and freeze the rest for future meals. Add chopped veggies and cook until tender, about 10 minutes on a high flame. 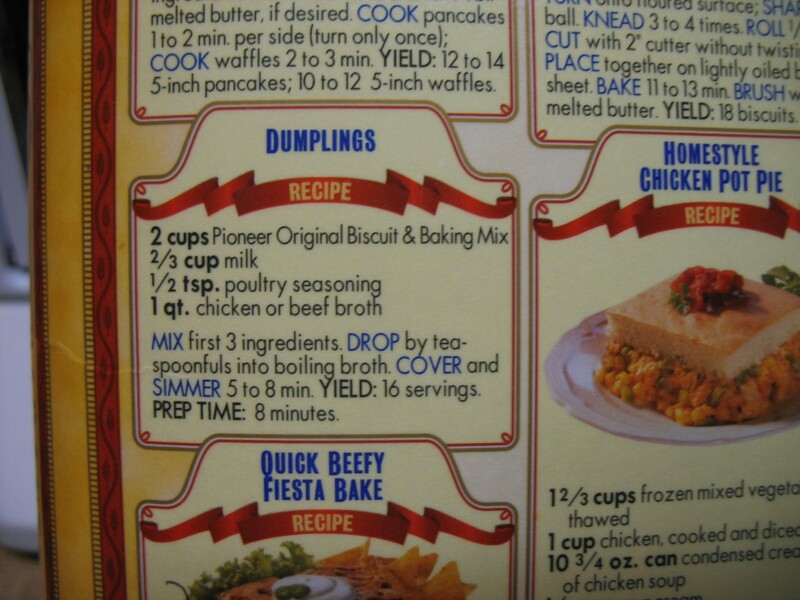 The secret for the dumplings: Pioneer Brand Baking Mix! 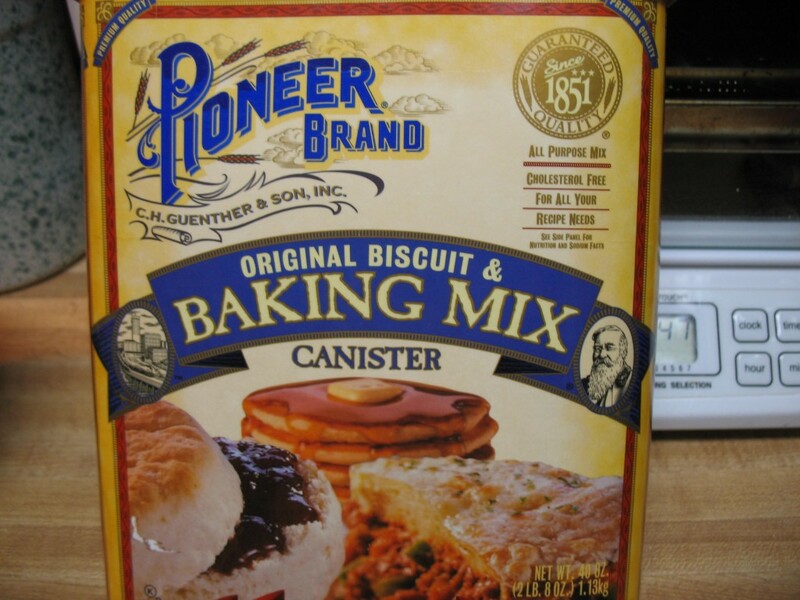 Bisquick is also acceptable. 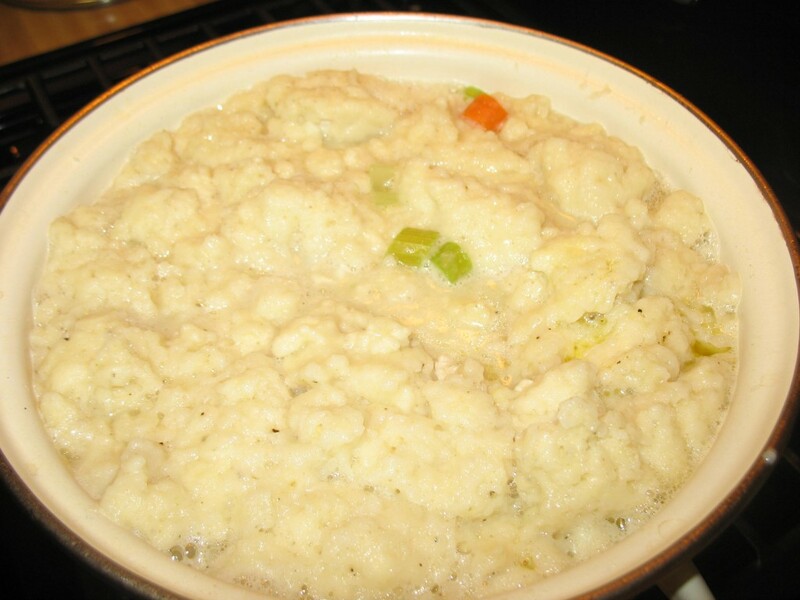 You can also make those dumplings from scratch as I have many times, but this is the easy way. Simple recipe is on the box. Handy! For this batch, I tripled the recipe (x3, yo!). 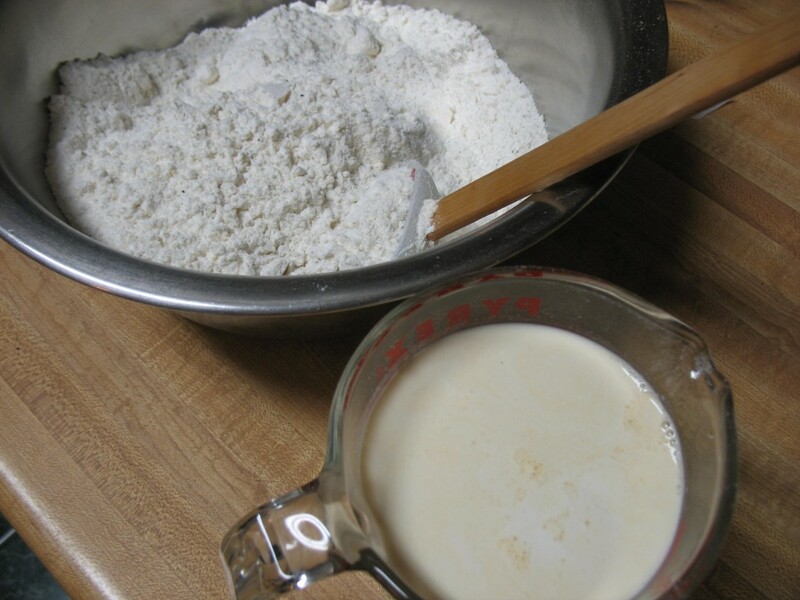 Measure your mix out and pour in the milk (note: I didn’t have regular milk in the house…thought i did, but didn’t…so I substituted evaporated milk ~NOT SWEETENED~and a bit of half-and-half. 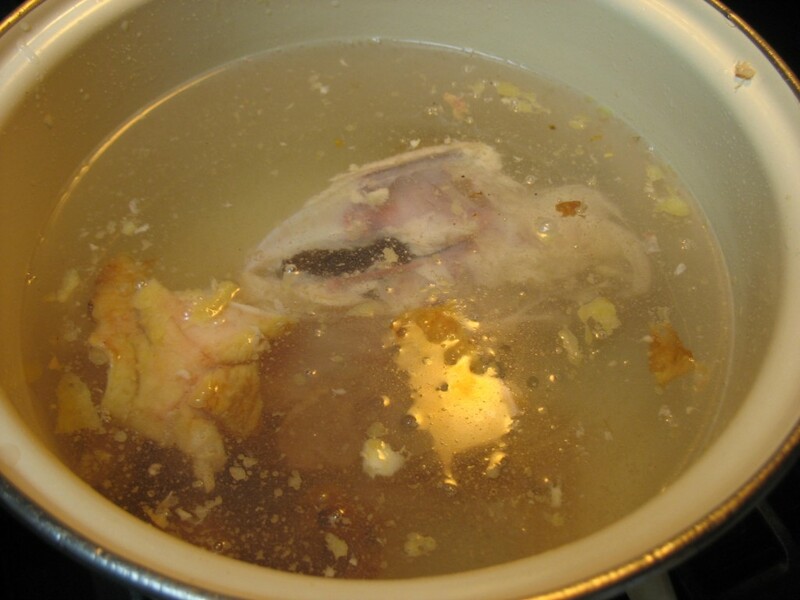 Place cut up meat into broth. 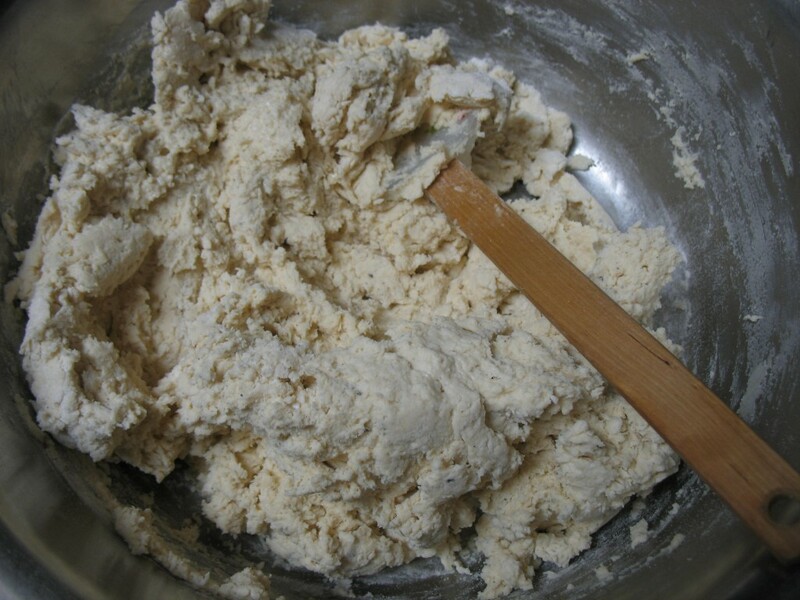 Place batter in by spoonfuls. I spoon in “dumpling” sized dollops. Follow dumpling cooking instructions on box. I allow another 10 minutes or so of uncovered cooking because of sheer quantity. You may not need this step. Oh, momma…. Can we have enough dumplin’ pics? 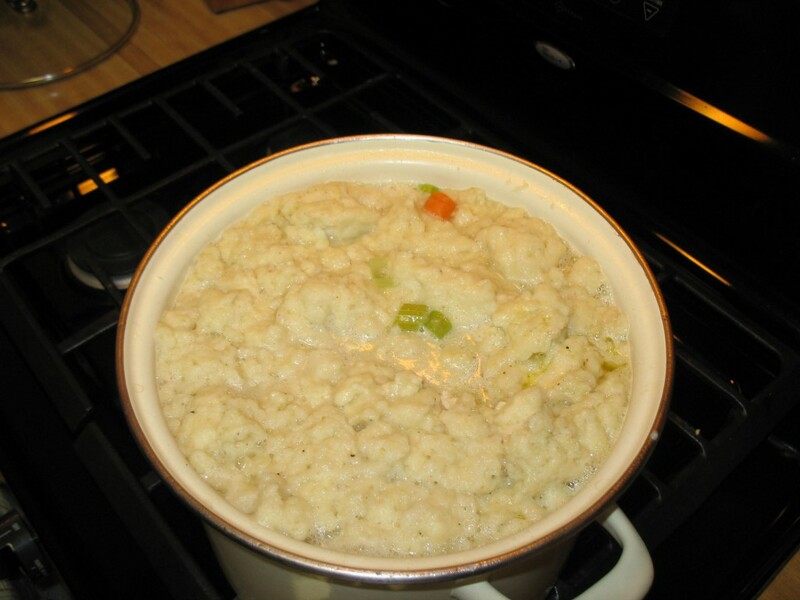 Leftovers have always been fought over in our house, especially the dumplings. 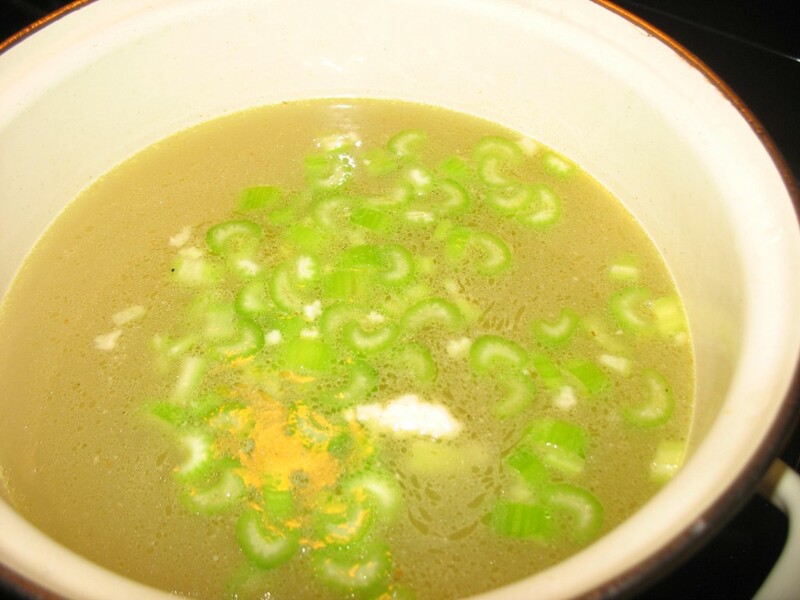 One caveat: The broth is burn-your-taste-buds-right-out-of-your-head hot. Don’t be like me, let this divine meal cool a bit before you dig in. Or dig in and live to tell the tale. LIKE ME! Happy Eating! I could eat a bowl or three of those! 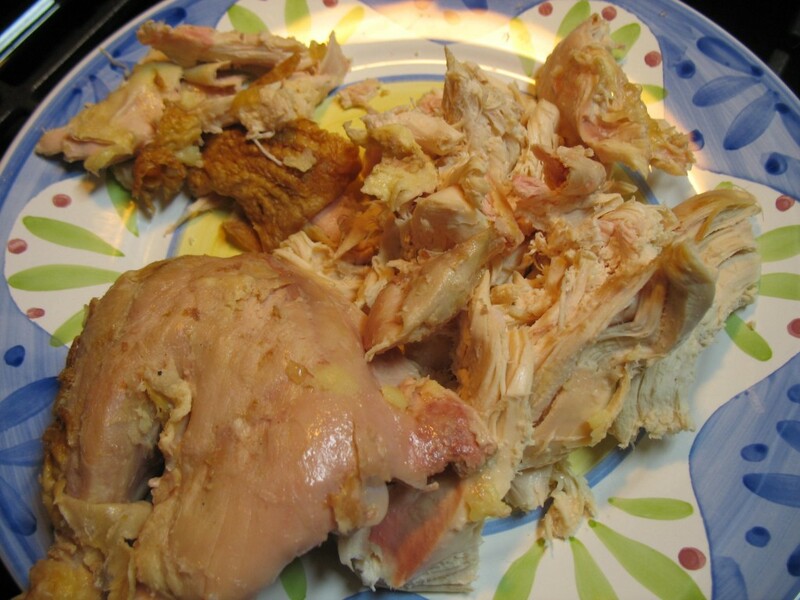 I’ve saved the recipe for next time whole chickens go on sale! Thanks! There is just a smidge of leftovers in the fridge. As we say in this house: snooze, you lose! Oh, how delicious this looks! I just finished dinner a bit ago and still, this makes me hungry. I love chicken and dumplings but haven’t had them in years. Thank you for the reminder of their goodness. 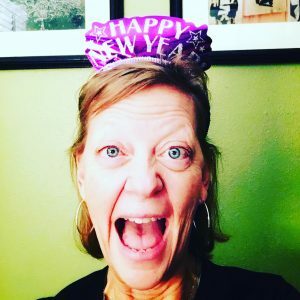 Great recipe…and I love the Sandra Lee reference as most of my cooking anymore is Sandra Lee style. Another great one for linking to the GRAND Social. Thank you for doing so! Would it help you to know I even drank a little, Sandra Lee Style, while making the CnD? (I really didn’t, but now kinda wish I had!) This recipe is so easy, albeit a little long, and delish. A family favorite. HA! This recipe is sooo easy (albeit longish) and delish. IF you make it let me know how it turns out. This is a family hit no matter what time of year! It’s incredibly easy and we all hog the dumplings. 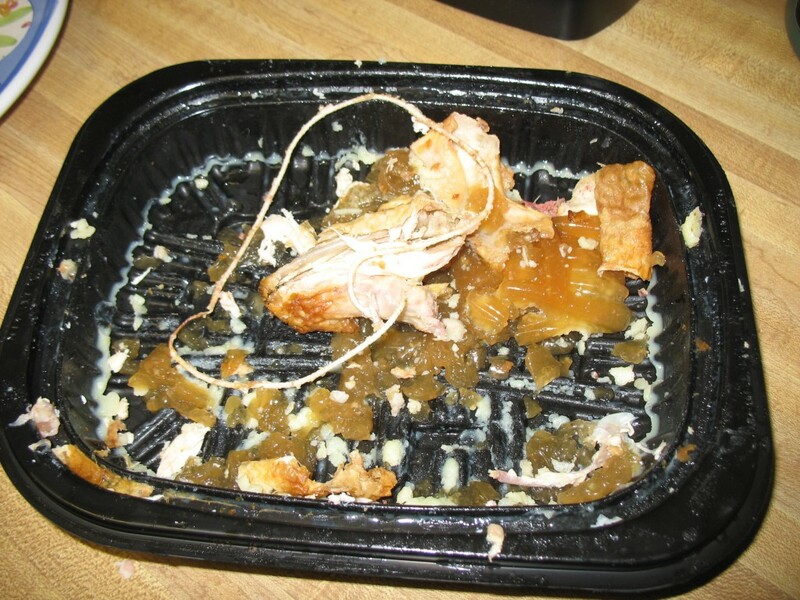 Great as leftovers too!